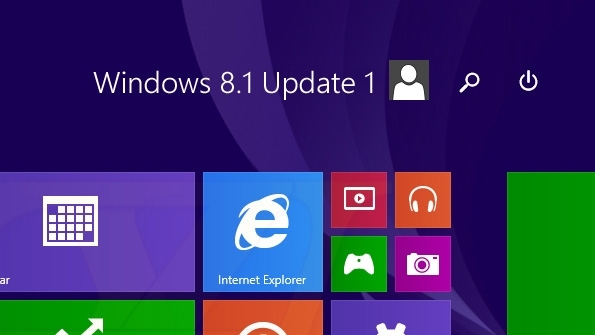 Most of us have enjoyed the windows 8.1 after the release of windows 8 but now there is windows 8.1 update 1 which means those on windows 8.1 can upgrade to windows 8.1 update 1 easily, this post we will be looking at how to install windows 8.1 update manually without the usual method where you go to Windows Store to update which takes time and also you won’t be able to have the raw setup file with you. So in this post, am going to show you how to download the wind0ws 8.1 update 1 to your computer and later install it on your computer easily and still able to have your raw file within your computer where you can easily share with friends and so on. So, the question is this, what is windows 8.1 update 1 bringing to us? what new features are added? lets find out. Power and Search buttons on the Start screen: The power and the search button are now located close to the account profile at the top right corner of the screen. So now, you can easily shut down your computer faster and also made searches easier. But if you don’t like this change the old place where shut down is still available. All open and pinned apps appear in the taskbar: Just like the windows 7, all apps opened and apps which are running in the store will be seen in the taskbar and also you can pin apps to the taskbar for easy access. Access the taskbar from anywhere: The taskbar can be accessed from different screens of the computer both the start screen and the desktop, so you can easily just move your mouse to the edge of the screen and the taskbar will show up (that in the start screen). Go to the desktop when you sign in, instead of Start: It not really necessary to boot into the start screen when you use the desktop more often, all this can be set. so when you boot your computer it will boot into your desktop straight. Remember what apps you recently installed: at the lower of your windows start screen, you can find the recent apps which you just installed inside. There also other many other new features on the windows 8.1 update 1, to be I love the changes made, it makes the relationship of user and the operating system more friendly which is certainly cool. So back to the main topic! Pick your computer bits and the download the file and after downloading the file. Right click on it and then “Run As Administrator” and the accept the conditions and it will install manually. Check and correct the link for the 32bit its not properly linked. Thanks for the info though, i find it very useful.